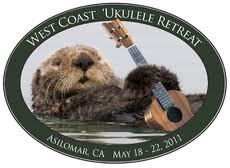 Early bird registration for the 2012 West Coast Ukulele Retreat ends on Friday, December 16. The date for this year’s retreat is May 16-20, 2012. The retreat is held at the beautiful Asilomar Conference Center in Pacific Grove (Monterey), California. Join top-notch instructors for five days of ukulele bliss in one of California’s most magical places. This year’s instructors include Gerald Ross, Fred Sokokow, Fred Fallin, Joel Echaus, Jim D’Ville, Andy Andrews, Mike DaSilva, Dave Egan and others to be announced. If you’ve ever wanted to take a ukulele vacation this is the retreat you should treat yourself (and your spouse, partner etc.) to. So save yourself some dough, and recieve a special thank you gift for signing up early. Oh, and the food is great!